J. 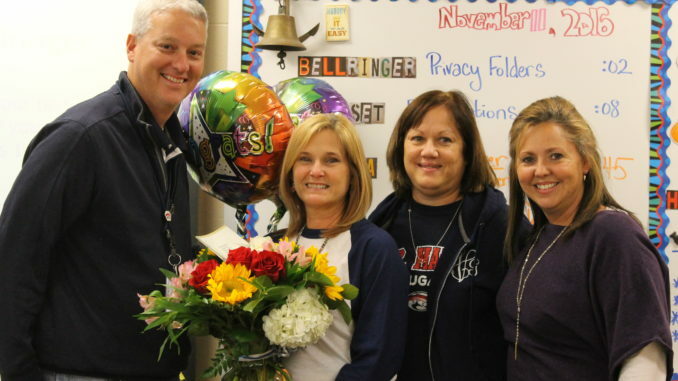 B. Martin Middle School recently selected seventh-grade reading educator Rebecca Lee as its representative for Teacher of Year for the 2016-17.Lee is a 16-year educator spending ten of those years in St. Charles Parish Public Schools. She has a bachelor’s degree in education for the University of New Orleans located on the Lakefront in New Orleans. She is a member of the school’s “Student Events Committee” where she serves as chair. Lee is married and has two sons. Lee said in after-school detention she saw a student come in with “a little attitude” announced she had no homework or anything to be completed for school that day. Lee said she resisted for a while and asked if there was anything else she could do. The student asked why the teacher was making her cry. Lee told her there are events in life that we need to do more than read about. The student grabbed it from the table and ran out the room, Lee said. The next morning, the sixth grader made her way back to Lee’s room and finished the book that night, and pulled another book from my shelf. Lee cried. Lee will represent J.B. Martin at the district level.